I think she’s here. 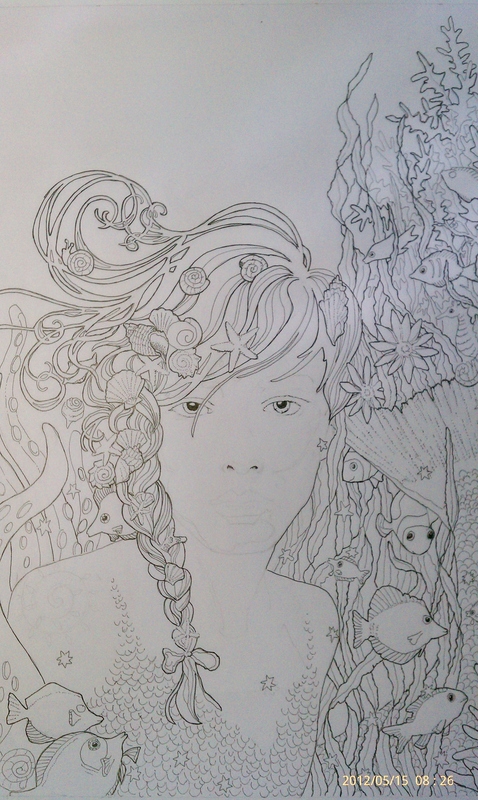 Have another layer of white pencil to do- that’s it for her face, I think. It for now anyway. Have these gorgeous tapestry scarves- I photographed them in the airport in Puerto Vallarta, Mexico. So some inspiration for the foliage on black background. My finished work! I have a great deal of my work hanging at Le Petit Marche. We had a little celebratory party on Saturday -(thank you to everyone that stopped by!) Sarah Landon sang for us with her wonderful, lilting voice- it was a fabulous evening! And A BIG SIGH OF RELIEF – I have no more unfinished artwork. Anywhere. I shamelessly used this show as a big incentive to finish all my unfinished works- which not surprisingly for moi – master procrastinator – amounted to quite a few pieces of work. It is sooo nice having a clean slate (and house.) Frees my mind to focus on other things, like getting into the summer schedule again, more kids, more beach, less alone time. This is a hard adjustment for me for the first couple of weeks, but then it seems to open up and my creativity returns, infused with a curious newness. Everyone settles into a comfortable routine and life carries on more or less peacefully. We are moving too, so living among, in and out of boxes adds an aura of temporariness. It’s a short sale, so we will find out (hopefully) any day that we are up and out. Viewing this as an adventure. Repressed excitement kinda thing. Like trying to walk normally on quicksand or thin ice. And it worked…. again. Thank God. So now I can heave a sigh of relief, and lay off the coffee a little, because if I mess up the fish, only their momma’s gonna know. You mess up a human face-well, that’s a little more problematic. I ended up using a different photo reference, rather than my daughter, because the picture I wanted to use was hard to see enough detail. This picture is for an Odyssey of the Mind fund-raiser. One of my students, Olivia, suggested it. Once it’s finished, I’ll scan it into Photoshop and ultimately it will go into a poster via InDesign. I’ll add words to it…etc. Sad or introspective? I would imagine modern mermaids theoretically get pretty introspective/angry as we systematically overfish and otherwise destroy their habitat. I just read COD, a biography of the fish that changed the world, by Mark Kurlansky, so I’m a bit touchy about this subject. It’s worth reading. I hear his other books are just as good. COD is a delightful read, quirky, interesting and unbelievable in the portrayal of how shortsighted yet optimistic we humans can be. Not knocking anyone- it’s just overwhelming to consider what we are doing to our planet. Self love. The only solution. So easy to say, so hard to do. See how I jump around? Honestly. 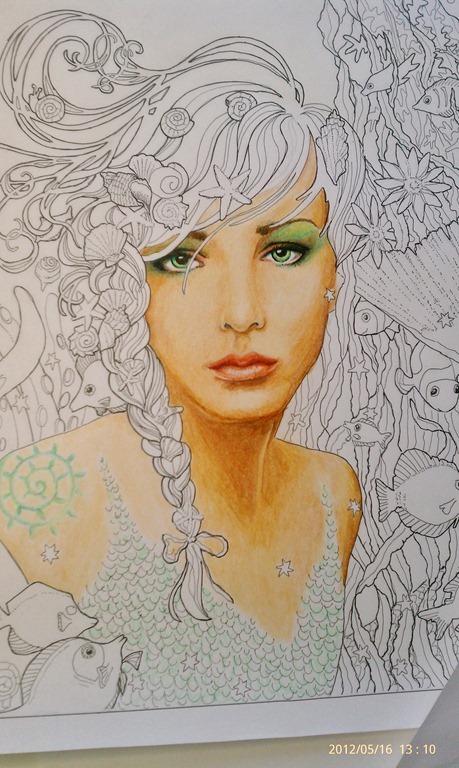 But I love this mermaid…I’ve wanted to do a picture of my oldest daughter Zoe, forever-and this is the one. So in between the Zinnia girl and the Green man popped this. I started her somewhere last week and am ready to color her in. 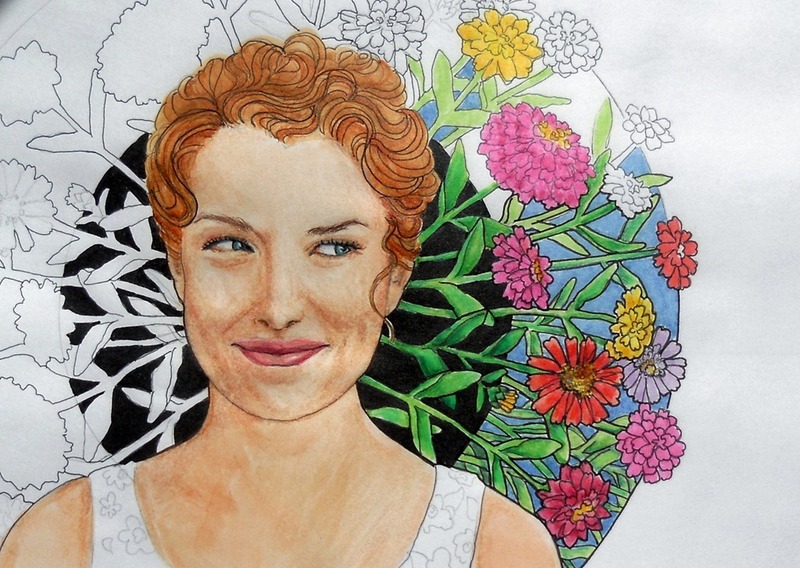 This pen and ink part is easy – just draw and outline like a coloring book. First in pencil, then a .25 and .35 rapidograph pen. I had a Google image search for ‘reef fish’ on my computer screen for reference, and Pandora playing. Pandora is fabulous. A music genome project…google it. Welcome to a new addiction. Usually I draw to French café music- (I prefer background music where I do not get distracted by the lyrics, in this case, because I do not understand them.) I think French chanson also makes me feel very, well, un-Mid-western. Somehow it imparts a subtle aura of coolness which is not always present to the degree I’d like in suburban Illinois…add to this, in the afternoon, a glass of wine? Well, decadent…french coffee houses, art, Paris in the 1920’s….understandably, my Muse just binges on this. However, for reasons that I do not understand, this mermaid piece needed the support of ‘Upside Down radio’ which is a Pandora station based on the song by Jack Johnson. Hootie and the Blowfish, The Postal Service, Bob Marley- that kind of music. So that is what I’m listening to, and since it’s only 9am, no wine- I’m caffeinating however. Nike comes to mind as the only possible solution. I pick up a marker. This is today’s work-almost done. 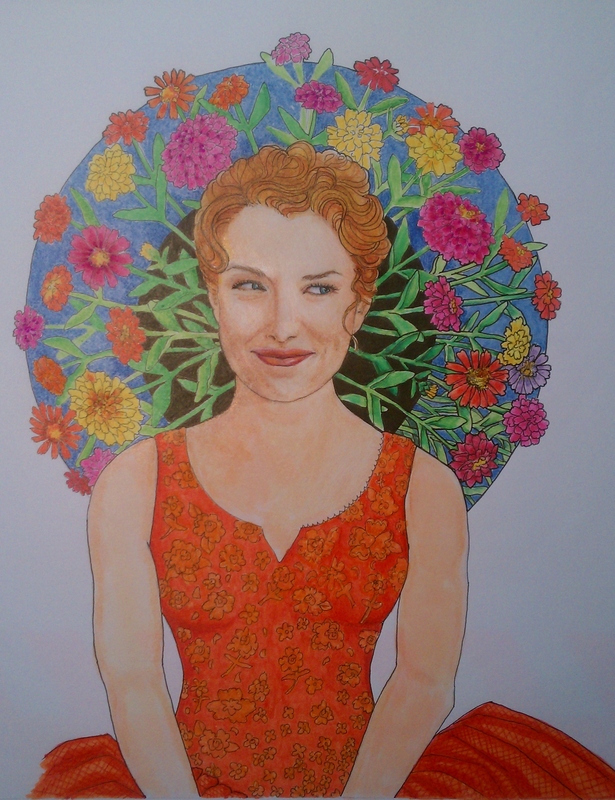 I had always intended for her dress to be pink….but after all my tangerine tango, well, orange it is. I like it. This is a photo from my phone – not the best, but what I have with me. Made some tea and am about ready to call it a day. I have a show coming up at the beginning of June- which is great motivation. Not that I need any these days. The Muse is present, she and I have struck an agreement I think. I try to remain calm, meditate and open myself to quiet-and she shows up regularly. Much easier said than done. I even ran this morning, which I do not do, but got the coolest app for my phone (it has to do something well, because photos aren’t its thing apparently) which promises to get me from couch to 5k. Well. We shall see about that. My husband, who is the reason everything in our lives runs so smoothly, has never actually said this to me, but I know he worries a little about my non-linear process, where nothing has a clear beginning or end. I used to worry about this too. Not so much anymore. As I’ve gotten older, I’ve become more comfortable with myself and my work style- plus, I get too many new ideas and too easily BORED to stick to one thing. This picture though is my favorite today. I love to do portraits with a unexpected backgrounds. More fun to create. Wow – I just realized a blog perk! Accountability. I feel as though I have to get moving on this now that you have seen it. Hmmm…could also be seen as pressure…I love it!